Be captivated by the magic of this ring set from the Enchanted Disney Fine Jewelry collection. Inspired by Snow White, the set comes with two rings and can be worn together or separately. Both rings are crafted from silver and possess their own charm. One ring has a simple silver bow with stunning diamonds and the other ring features the signature apple in 9ct rose gold with a garnet stone. 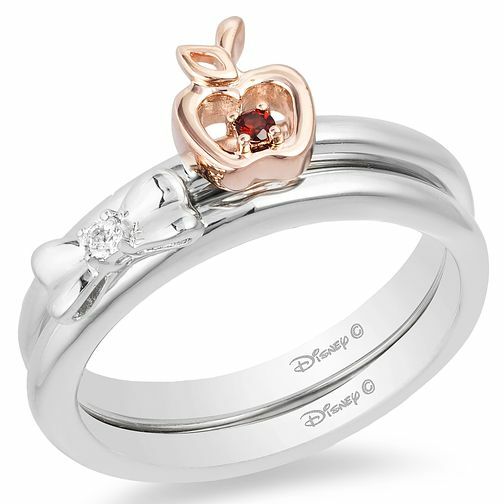 Enchanted Disney Fine Jewelry Diamond Snow White Ring Set is rated 3.0 out of 5 by 1. Rated 3 out of 5 by Anonymous from Nice but expensive for what it is. The stones within the ring look a lot bigger in the pictures than in the actual ring itself. They are tiny tiny tiny. Very disappointing considering the price paid for a silver ring. Anyone considering this would be best to go see it in store before buying it.